Cab Calloway School of the Arts opened as the Creative and Performing Arts Middle School in 1992 and expanded with a high school program in 1997. CCSA boasts cutting edge education as a premiere arts-based public school with six major areas of study: Dance, Drama, Visual Arts, Communication Arts, Instrumental Music and Vocal Music. Standing by the promise to continue that cutting edge education in the arts, the Red Clay School District commissioned a major renovation of CCSA’s auditorium. The auditorium’s beautiful overhaul included complete audio system replacements by BEL.com. The immaculate audio is centered around Meyer Sound front of house speakers. A trio of Meyer Sound’s MSL4 speakers anchored as center mains with a 700HP subwoofer and CQ1, CQ2 (narrow coverage), DF4 (dedicated downfill), UPA1P (delay) and UPM1XP (wide coverage) to ensure that there isn’t a bad seat in the house. The main center speaker cluster is suspended by custom rigging designed by BEL.com in conjunction with APE Rigging (Advantage Products Enterprise, Inc. of Jupiter, FL). BEL.com also installed an HD Vaddio PTZ camera system to allow a spectrum of coverage from wide to close up and even a view of the orchestra pit beneath the stage. A pair of 90” Sharp LCD displays flank the stage along with 52” Sharp LCD monitors over each rear exit to provide even more visibility of the stage and its surroundings. 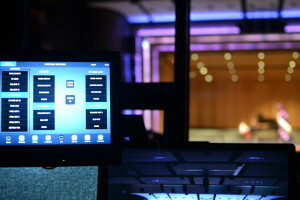 Custom integrated control of audio and video features a Crestron 3 Series System programmed to CCSA staff preferences by BEL.com Crestron certified programmer Nicholas Marques. 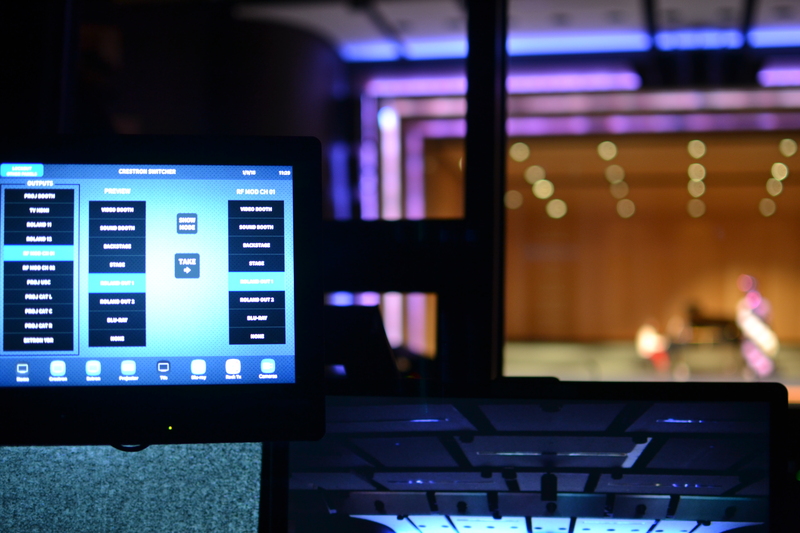 Custom integrated control of audio and video features a Crestron 3 Series System programmed to CCSA staff preferences by BEL.com Crestron certified programmer Nicholas Marques. The intuitive design allows even new users a painless and logical learning curve while keeping the cutting edge technology intact. The installation also included a Listen Technologies Assistive Listening system to ensure hearing impaired attendees can also enjoy the top notch productions CCSA produces. Attendees of Cab Calloway School of the Arts productions since the renovations have compared the facilities and production potential to that of professional Broadway productions. BEL.com is dedicated to providing professional audio-visual services to schools like CCSA to ensure their students have the greatest hands-on learning experience in the arts.